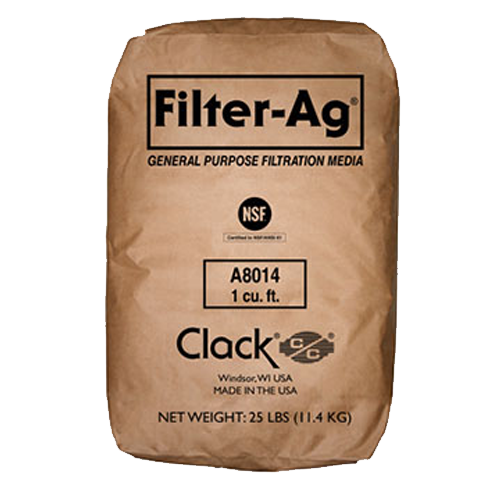 Filter-Ag® has many outstanding advantages over the more common granular filter medias used for suspended solids reduction. Its fractured edges and irregular surface provides a high surface area and complex flow path for efficient removal of suspended matter through out the filter bed, typically reducing suspended solids down to the 20-40 micron range. Filter-Ag’s larger particle size creates less pressure loss through the filter and allows deeper sediment penetration into the bed for higher sediment loading and longer filter runs. This large and irregular shape prevents the screening and caking of sediment in the top several inches of the filter bed as happens in the typical sand filter, thus preventing a rapid build up of headloss and blinding problems. Filter-Ag’s light weight means lower backwash rates and better bed expansion to release trapped sediment and rinse the filter media during the backwash cycle. This ideal combination of particle shape, size and density make it a good choice where quality water filtration and water conservation are important. Although not intended to be an iron reduction media, extensive field experience has shown Filter-Ag’s rough and jagged surface to be very good at entrapping the fragile iron flock that forms after dissolved iron has been oxidized. The fragmented edges are apparently good flock collection points for the precipitated iron. Typical oxidation methods include aeration, ozonation and chlorination. Substantial savings can be realized when designing a system using Filter-Ag®. Its low pressure drop, high service flow rates and high bed loadings combined with lower backwash rates allow economy in equipment downsizing and reduced pumping requirements. Its light apparent density also saves on handling expense and shipping costs. Filter-Ag® can be applied to systems designed for either pressure or gravity flow. Because of its unique density, Filter-Ag® can also be used in multi-media (graded density) filter designs allowing a more flexible approach to difficult filtration problems. Replacement of sand with Filter Ag® in existing installations may increases filter capacity 100% or more.